Greg Elsasser has been a high school and junior high teacher in Los Angeles County for twenty-five years, and currently teaches English and drama. Every year he takes his students on a field trip to Europe. He is a published playwright of six plays and the creator/writer of the award-winning television series The Adventures of Roman and Jorge. As an actor, Greg has appeared in Living Waters’ movie “Audacity” and several episodes of The Way of the Master TV show. He and his wife, Kristie, have three boys and live in Southern California. To learn more about Greg and his current projects, visit his Facebook page at Facebook.com/greg.elsasser. 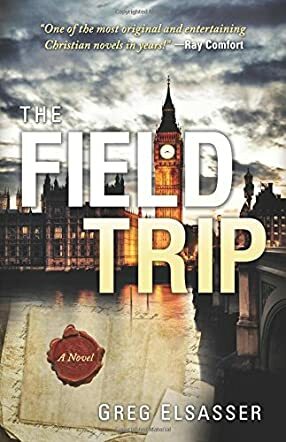 There is very little that is as it appears to be in The Field Trip, making for a twisting and turning plot that pulls you in and doesn’t let go until the last word of the book. There are many characters in The Field Trip that are necessary to the suspense, but the main character is Chasen Derrick and his most annoying student, Eddie. Chasen is currently working at the Dysart Academy, receiving an unusually large salary that he appreciates but never questions. He halfheartedly agrees to take a class on a field trip to England, and he and the students set off to enjoy their sightseeing in London. The trip is off to a good start until they become bystanders in a fire and then everything is turned upside down and sideways. As they plan to board the bus to the next spot in Oxford, two students are missing and Chasen hurries off to find them. The students load onto the bus and are driven away without their teacher. Chasen then finds himself and Eddie (the missing student) stranded and they soon are being accused of terrible deeds. The two find themselves being the hunted and use all of their strength, wits and knowledge to move from scary situation to life threatening situation. No one is whom they think and everyone they come across may or may not be a friend or the enemy. The Field Trip kept me up long past my bedtime and had me ignoring my daytime chores. I can honestly say that this is the best Christian fiction suspenseful book I have read in, well, forever. Greg Elsasser is brilliant in his combining of God, mystery, intrigue and fantastic characters. He brings in religion without it becoming overwhelming; suspense permeated throughout the story and believability was top notch. I was never 100% certain if it was all really fiction or if perhaps there was some truth in it; that is how well the story was presented. Please do not pass this one up; it is sooooo good.